1. This is a public auction and mailbid sale conducted by Artemide Kunstauktionen GmbH Subject to our consent, liberty for bidding by sellers and/or consignors is hereby reserved. 2. A 18% buyer’s charge will be added to the “hammer price” or winning bid of each lot. 3. All material shall be sold to the highest bidder as determined by the Auctioneer. If any dispute arises during or immediately after the sale of a lot, the Auctioneer shall have the right to recall the lot and put it up for sale again. In all cases, Auctioneer’s decision shall be final. For the bidder’s protection, NO “UNLIMITED” or “BUY” BIDS WILL BE ACCEPTED. Bids are to be made in EURO currency only. 4. Terms of this sale are strictly cash with payment due immediately upon receipt of invoice. Title to all lots remains with consignor until paid in full. 5. Floor bidders, internet and mail bidders are not known to Auctioneer must furnish satisfactory credit references, sufficiently in advance of the sale to allow for checking, or per the discretion of the Auctioneer, a deposit equal to 25% of their total bids for that session(s) before such bids can be accepted. Deposits submitted will be applied to purchases and any unused portion of such deposit will be promptly refunded. All bid sheets submitted by mail bidders must be signed. Company bids must be submitted with the signature of a duly authorized agent of such company. If you bid by mail, mail your bid sheet early. Mail bidders agree to and are subject to these terms of sale just as they were floor bidders. 6. All bids must be per lot as numbered in this catalogue. Lots will be sold in their numbered sequence unless Auctioneer directs otherwise. Auctioneer can not be responsible for errors in bidding. Please make certain that you bid on the correct lot and that your bid is the maximum you are willing to pay. 7. A base price is provided for each lot. Lots may sell for equal or above this base price. No bid below the base price will be accepted. 8. 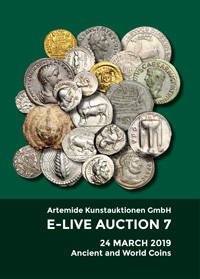 If Auctioneer, in its sole discretion, determines that any numismatic property is substantially and materially different from that represented in the catalogue of sale, or in any written advertisement or material, the sale shall be cancelled and Auctioneer shall refund the purchase price to the Buyer. 9. All items in this catalogue are considered genuine unless specifically stated otherwise in the lot description. Claims to the contrary must be made in writing within 7 days after receipt of the lot. Any returned lot must be intact and in its original unopened holder. No lot may be returned without prior written consent. In no event may any lot be returned after thirty (30) days from the date of the sale. LATE REMITTANCE FOR PURCHASES CONSTITUTES JUST CAUSE TO ABROGATE ALL RETURN PRIVILEGES FOR ANY REASON. 10. Grading is a subjective description, in the opinion of the cataloguer as to the state of preservation, method of strike and overall appearance of a particular coin or lot. The term “Proof” or “Specimen” is used to describe a method of manufacture and is not a grade or condition or an attribution; Auctioneer does not represent that any coin catalogued will meet the standards, or the grade, of any third party or third party grading services. Adjectival descriptions and terminology (which can and does vary among experts and knowledgeable purchasers), when utilized in the catalogue, are strictly the opinion of the cataloguer and shall not be deemed to be part of the description; i.e., it is an opinion only and not a warranty of any kind. 11. This is not an approval sale. Bidders are expected to promptly purchase all lots awarded to them by the auctioneer and they understand that for this sale there is no right to withdraw. All bidders are encouraged to carefully examine the lots before bidding, either in person or by contacting Artemide Aste requesting additional pictures and informations. 12. Mail bids will be accepted from those who can not attend the sale in person. Bids for all lots must be submitted in Euro amounts. Mail, fax or emails bids must be received prior to the closing date of the auction or there will be no guarantee that they will be timely executed. Successful mail bidders will be awarded the lot at a nominal 5% or 10% over the second highest mail or floor bid. When identical bids are received by Auctioneer for a lot, preference is given to the first bid received. A mail bid will take precedence over an identical floor bid. A floor bidder must bid higher than the highest mail bidder to be awarded any lot. 13. Auctioneer reserves the right to refuse to honour any bid or to limit the amount of any bid which, in his opinion, is not submitted in “Good Faith”, or, as the case dictates, is not supported by satisfactory credit and numismatic references, as Auctioneer, in its sole discretion, shall determine. A bid is also considered not made in “Good Faith” when it is made by an insolvent or irresponsible person, or a person under the age of eighteen. Auctioneer reserves the right to exclude any person it deems in its sole opinion is disruptive to the sale or is otherwise commercially unsuitable. Auctioneer reserves the right to rescind the sale in the event of any non-payment, breach of warranty, disputed ownership, Auctioneer’s clerical error or omission in exercising bids and reserves or otherwise. 14. All photographs in this catalog are of the actual items being sold. Sizes and weights are indicative: in the unlikely event of an error in the size and/or weight reported on the catalog, this does not constitute a right for the bidder to cancel his purchase. 15. Postage, insurance and sales tax, if required by law to be collected, will be added to the invoice for any lot(s) invoiced to successful bidders. 16. Auctioneer reserves the right to require payment in full before delivering any lot to a successful bidder. It is the buyer’s responsibility and obligation to have the lots fully insured while in his/her possession. Risk or loss is on the buyer. Please send shipping instructions. 17. In the event a bidder fails to make remittance promptly, auctioneer reserves the right to resell the merchandise and bidder agrees to pay for the reasonable cost of such a sale and also to pay any difference between the resale price and the previously successful bid. 18. Auctioneer reserves the right to postpone the auction sale for a reasonable period of time, as the result of any significant relevant event, which, in the judgment of Auctioneer, reasonably exercised, make it inadvisable to hold the auction. 19. By bidding in this sale, bidder personally guarantees payment; if a corporation is the bidder, the officers and/or principals of the corporation agree to personally guarantee payment. Mail or fax bids must be signed. 20. Auctioneer reserves the right to include its own material in any auction sale. Auctioneer may have direct or indirect interests in auction lots. Auctioneer may make loans or advances to consignors and/or prospective purchasers. The Consignor may be permitted to bid on his, her or their own articles and to buy them back at the sale. Any Buyer who bids on or purchases their own goods is required to pay for them, in full, as the terms of sale provide for together with the full buyer’s commission, and any other applicable surcharges, postage, handling, insurance fees and taxes, without rebate of any kind whatsoever, unless provided for otherwise by contract with Auctioneer. Auctioneer reserves the right to make accounting adjustments in lieu of payment. Settlement will follow the auction. The prices realized reflect the final price called by Auctioneer and may include a bid of a consignor reacquiring their lot. 21. In the event Auctioneer shall, for any reason other than set forth in paragraph 8, be unable to deliver the property sought to be purchases, its liability therefore shall be limited to the rescission of the sale and refund of the purchase price and buyer’s. Auctioneer shall have no liability for damages, incidental, consequential or otherwise, arising out of its failure to deliver any property purchased, and all bidders agree to this. 22. Auctioneer shall have a lien against the merchandise purchased by the buyer and any other property of the buyer then held by Auctioneer to secure payment of the auction invoice(s) and any other amounts due to Auctioneer from the buyer. 23. It is unlawful and illegal for Bidders to collude, pool, or agree with another Bidder to pay less than the fair value for lot(s). Bidders in the sale acknowledge that the law provides for substantial penalties in the form of treble damages and attorney’s fees and costs for those who violate these provisions. 24. Any dispute regarding this auction shall be governed by the laws of the Republic of Austria and shall be adjudicated only by the Court of Vienna. 25. Bidding in this sale (by any means) or participating in this sale constitutes acceptance by the bidder or participant of all the aforementioned terms and conditions of the sale. 26. The terms of sale exist in several languages. In the event of dispute, the English version is considered valid. Artemide Kunstauktionen GmbH may reduce or comprise any charge or fee at its discretion.